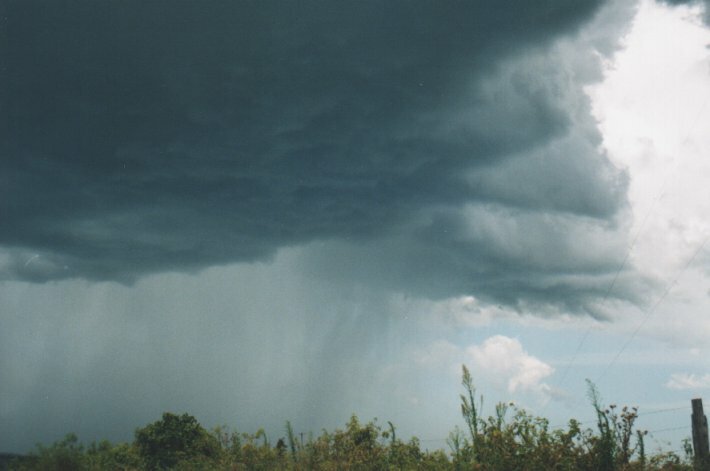 destructive winds and very heavy rainfall. A cell's just about to hit here in Ballina .......up to yellow on the radar...thunder almost continuously here. Chase map for 5th January 2000 [139Kb]. Distance covered: 80km. Thanks to John Woodbridge for the beautiful piece of reverse psycology on the weather - it worked well here! Signs this morning were not hopeful, with not a cloud in the sky and moderate W-SW winds blowing (I think?). Later, there were a few patches of altocumulus lenticularis but mostly towards the north. 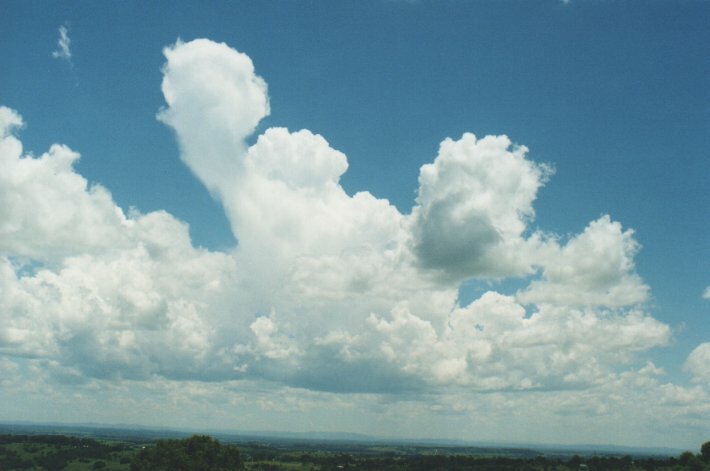 But very quickly late morning a field of cumulus developed and by 12.30pm congestus was developing W of Lismore. 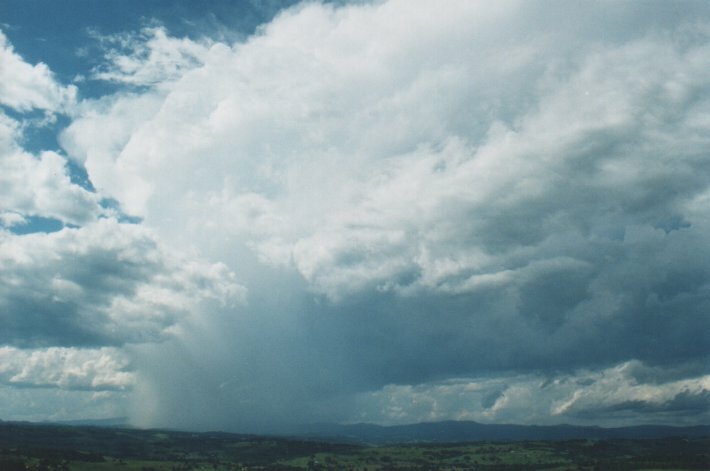 I left my place at 1pm with a cell gathering strength SW of Lismore. It was very slow in developing at first with a couple of turkey towers, and anvil rain or virga spreading out in front towards the east. 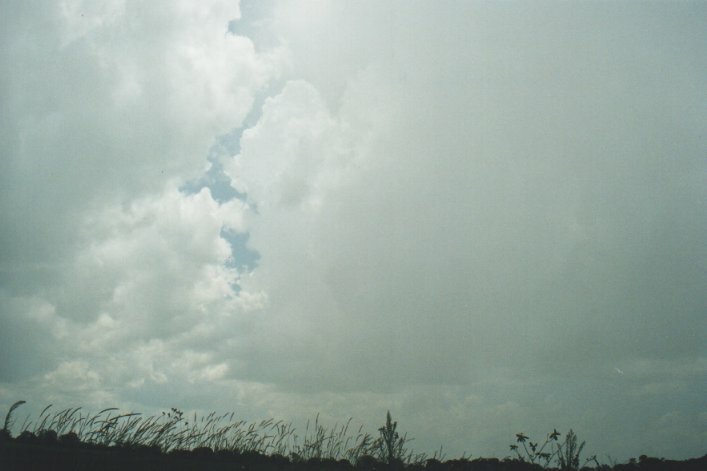 But updrafts kept persisting. 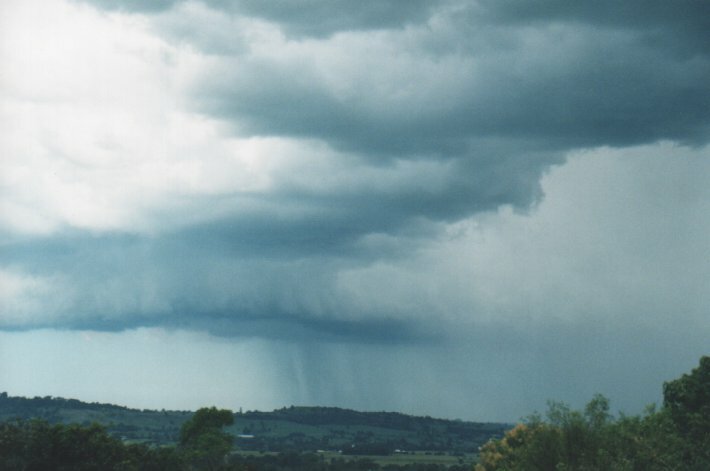 By 2pm I was near Wyrallah, S of Lismore and in some rain from the developing cell - there was no lightning observed at this stage. 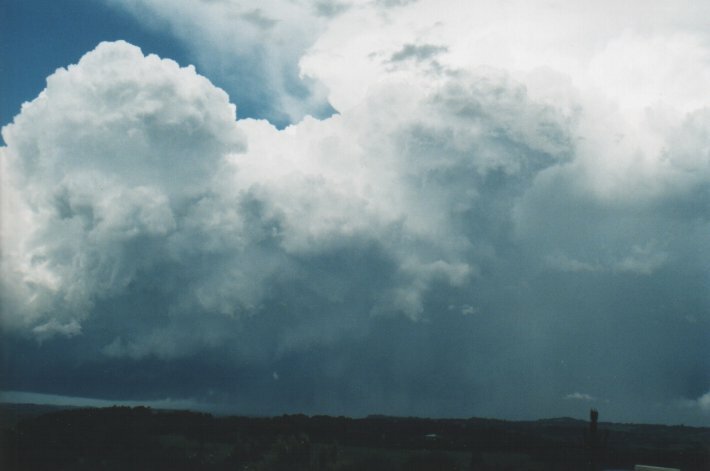 Either two cells got going very close together or the one split into two - I'm not sure - but soon there was heavy precipitation just to my N with its boiling updraft visible to my NW, then a gap to the second one just to the W-SW. The W-SW one dominated for the moment but as I moved further NW it weakened and probably collapsed after a while. 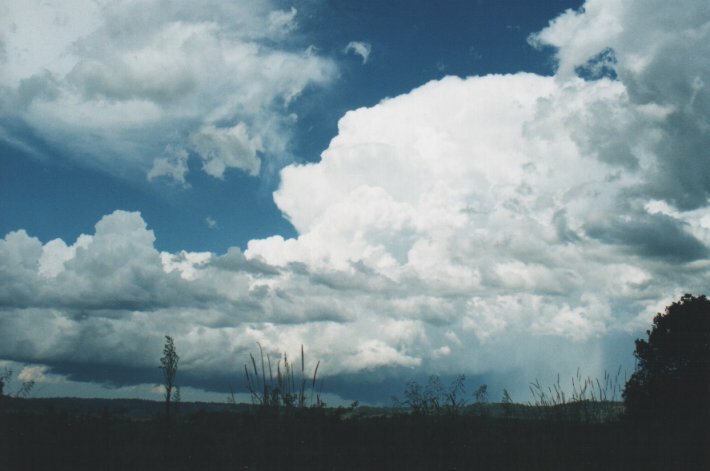 The north cell really took off at this stage (~2.20pm). 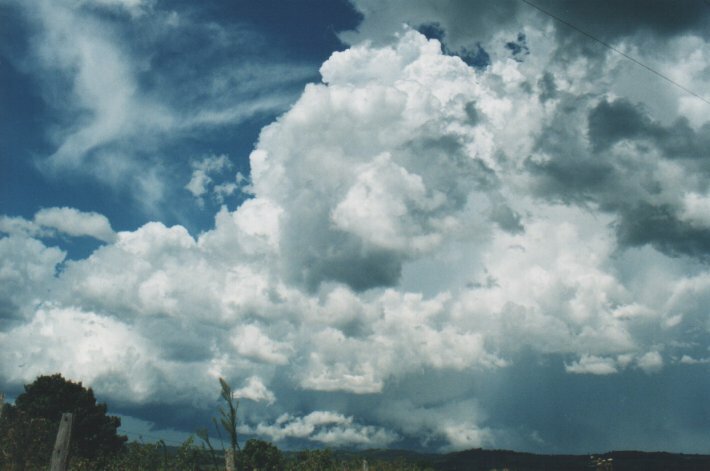 As I was now W of the cell, it became very high constrast and just beautiful to observe. 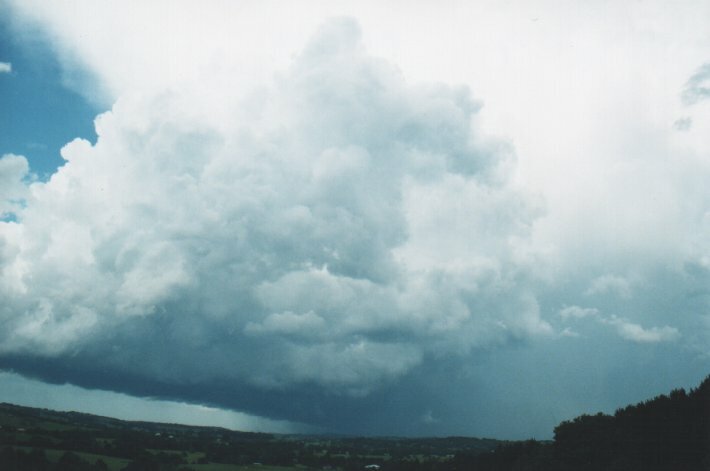 Towards the NE a shelf cloud or gust front was developing, while heavy precipiation was developing at the rear (SW). Lightning was occurring regularly now with quite a few CGs observed, some of which were close by to me from out the back of the cell and along a line of congestus spreading further west. 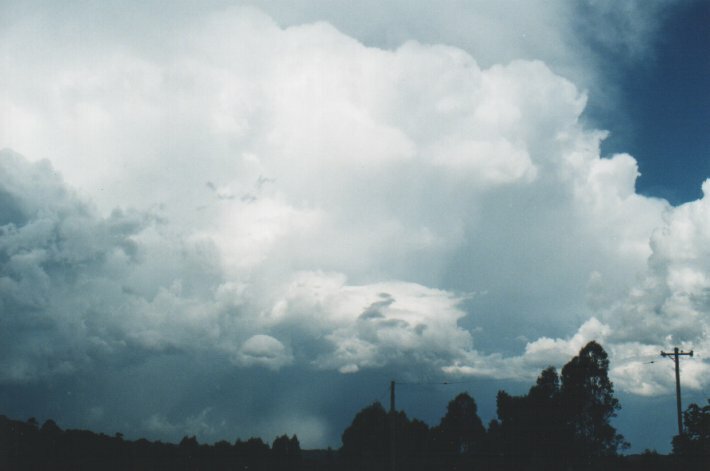 The storm moved slowly NE and all the time base lowereings and scud were observed to the left with the very heavy precipitation to the right (from my view looking eastward). 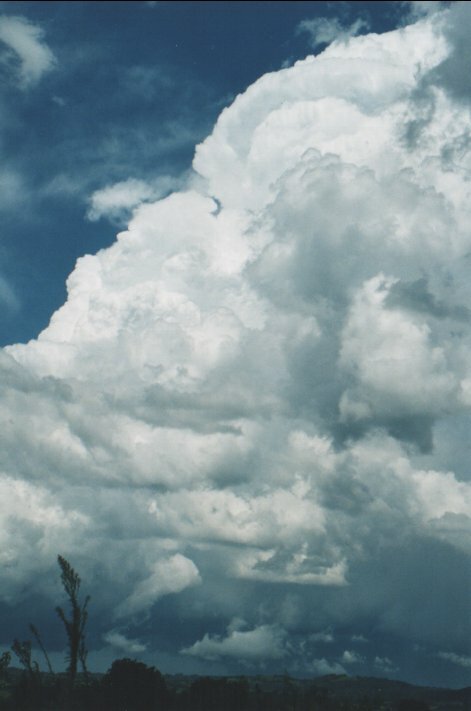 Powerful new updrafts kept forming on the NW flank. 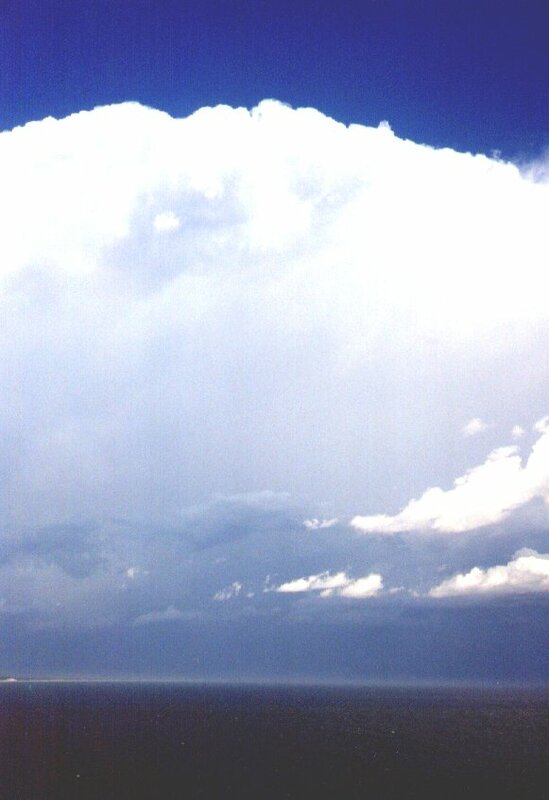 The whole storm structure did seem to be rotating with quite a marked clear area in the middle. 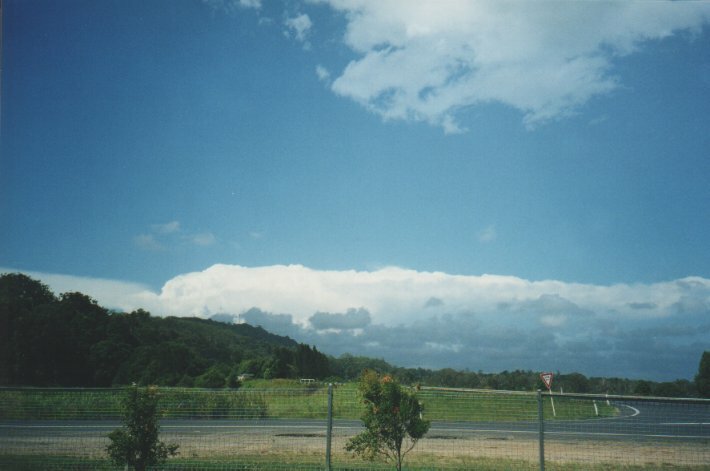 The more distant cloud to the NE on the gust front was moving towards the left (north), while at the back (NW and W) I could see it moving towards the right (south), and in the middle a lighter area. 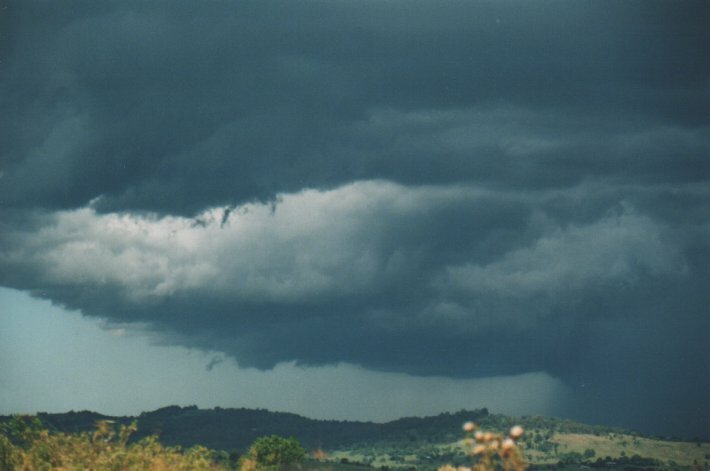 This persisted for the whole time I watched the storm from this time (~2.40pm). Needless to say it was an awesome sight ! With each new boiling updraft spearing up the flank, there were more and more lowerings, prongs, and scuds on or close to ground level. I left my location SW of Lismore after 3pm trying to get closer and to watch the new cells develop along a spectacular flanking line towards the NNW. 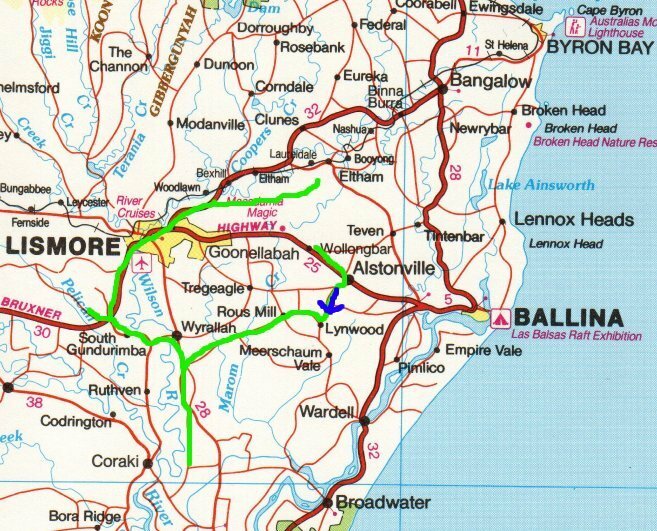 Of course I got stuck by a frigging Frigmobil semi trailer just leaving Lismore and going slow! AAARRGGH. 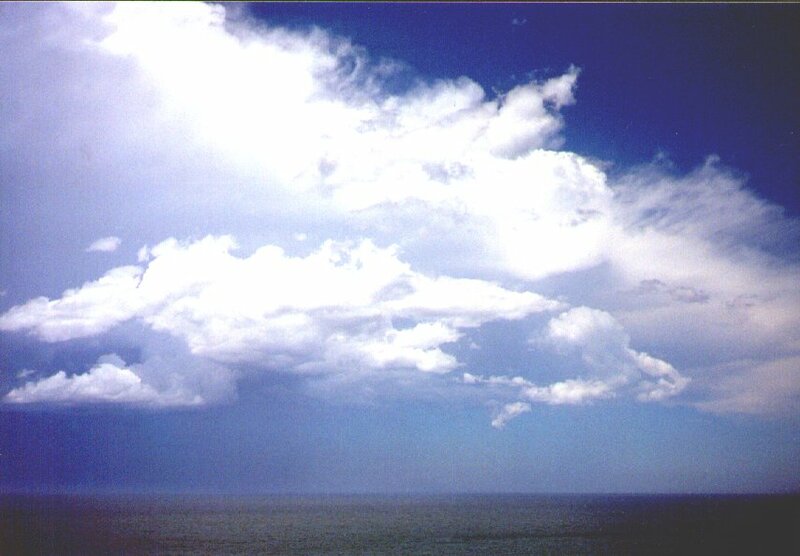 Anyway, I soon reached McLeans Ridges and watched the spectacle which was probably over Cape Byron now (3.30pm). 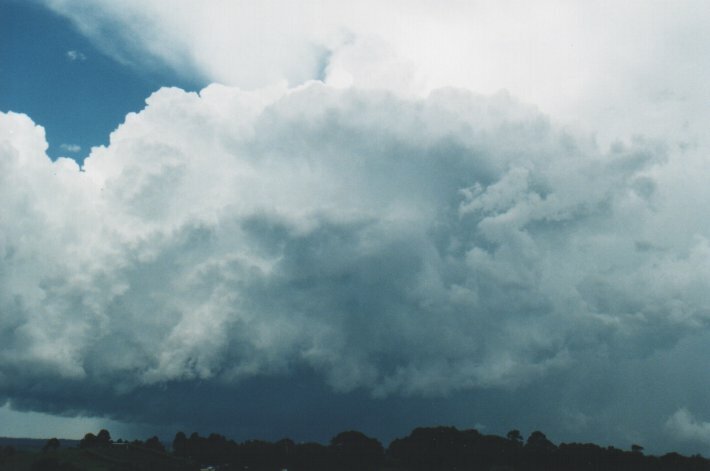 It was huge - clouds tops were over 15ks in height or more from my guess, backshearing was eveident as each new updraft developed and the persisting gust front was still visible out to the NE and the heavy precpitation to the east (southern part of cell). CGs were occurring in this region also. 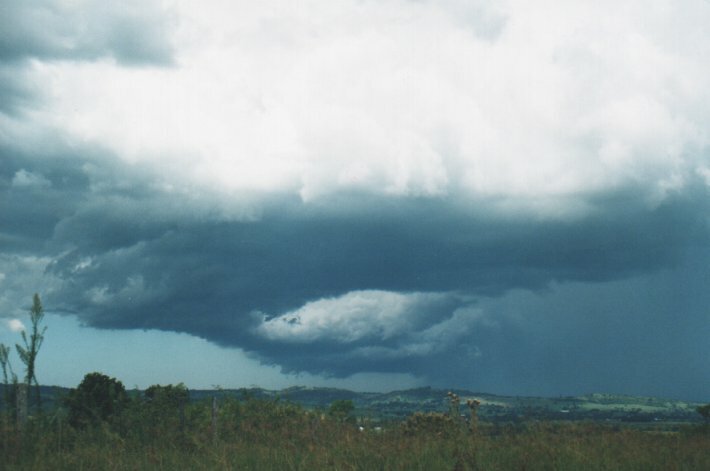 And still the whole structure appeared to have an overall rotation (anticlockwise if viewed from above). 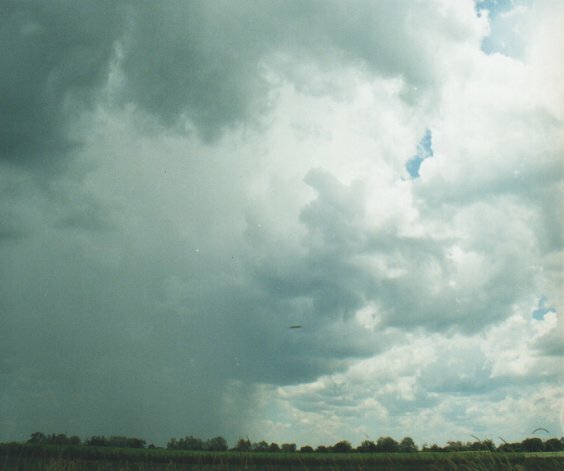 Lowerings and all sorts of features teased on the developing area, but no funnels or obvious wall clouds were evident. The storm became obscured somewhat around 4pm and nothing more was developing (apart from over the water, and to the north) so I decided to go home. 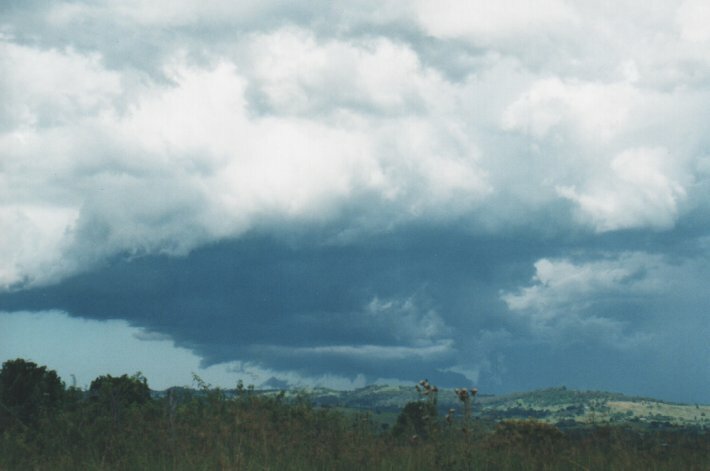 I stopped briefly to photograph a cell which had suddenly strengthened while passing over the ranges north of Lismore. 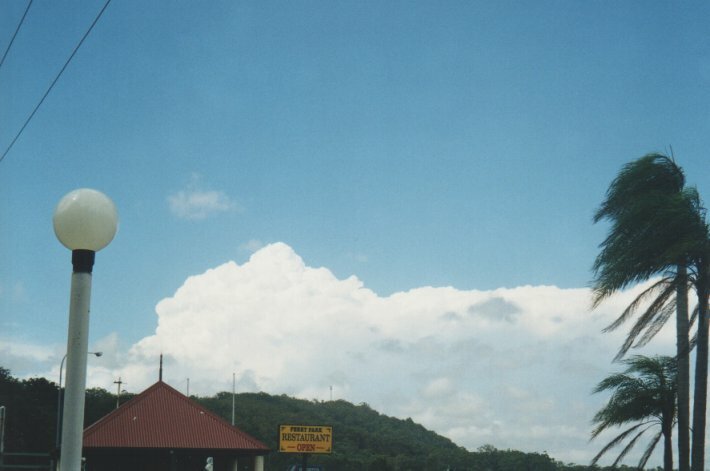 It had developed around 2pm near Kyogle but although persisting, was weak for the 2 hours preceeding. 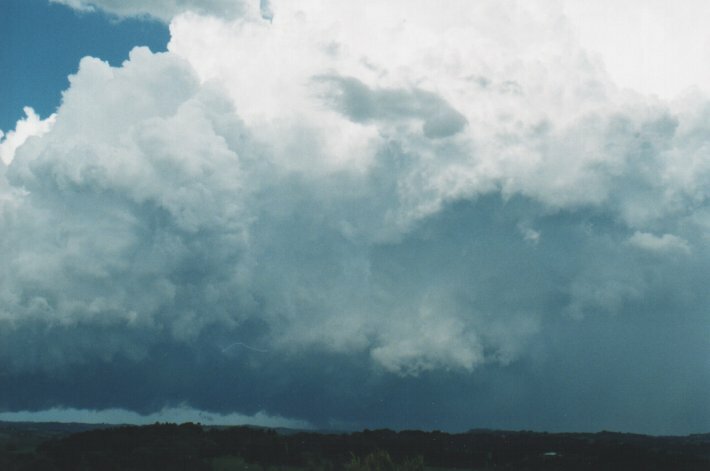 The main storm may have been a supercell - structurally it took on the right appearance, was rotating, developed around 1pm and possibly split with the right mover collapsing. 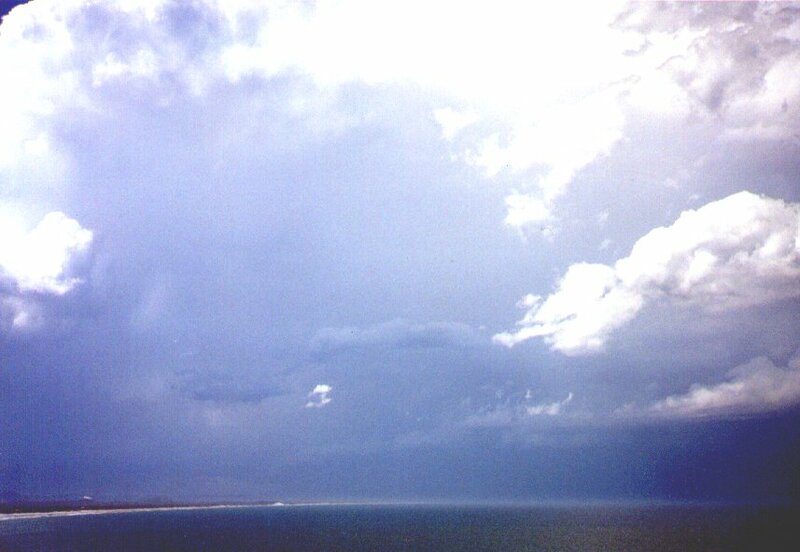 The storm is still going strong off the coast noth of Byron Bay as I write this at 5pm. The surface temperature in the Far North Coast region reached about 34 today, several degrees above forecast, as a SE change approached. 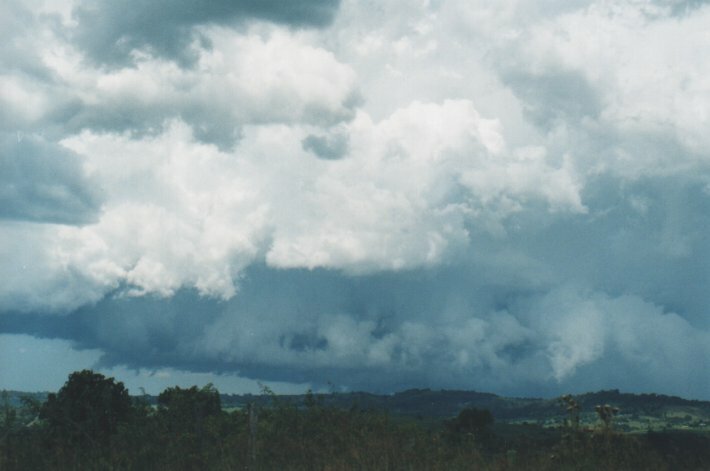 The change was visible from early afternoon as a line of broken stratocumulus / roll cloud formation extending from just south of the storm and inland towards the WSW. It probably played a significant part in the strength of the storm. 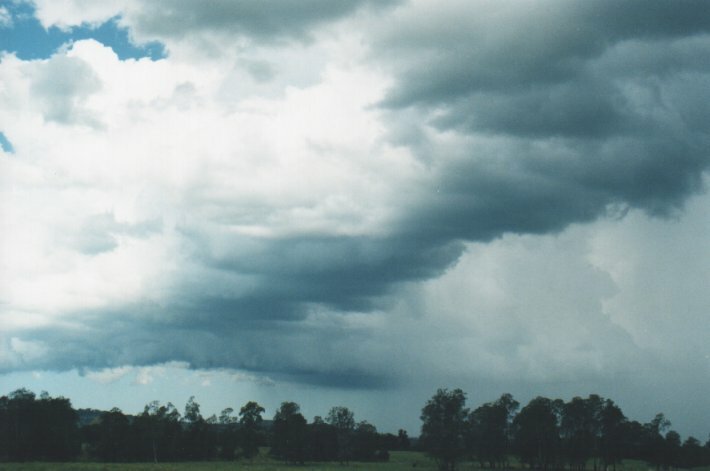 The following two photos were taken from Maclean, 60km S of Lismore just after 3pm - note the overshoot in photo 26 which can be seen in verticle photo 14 above also. has been cancelled as severe thunderstorms have now cleared out of the area. 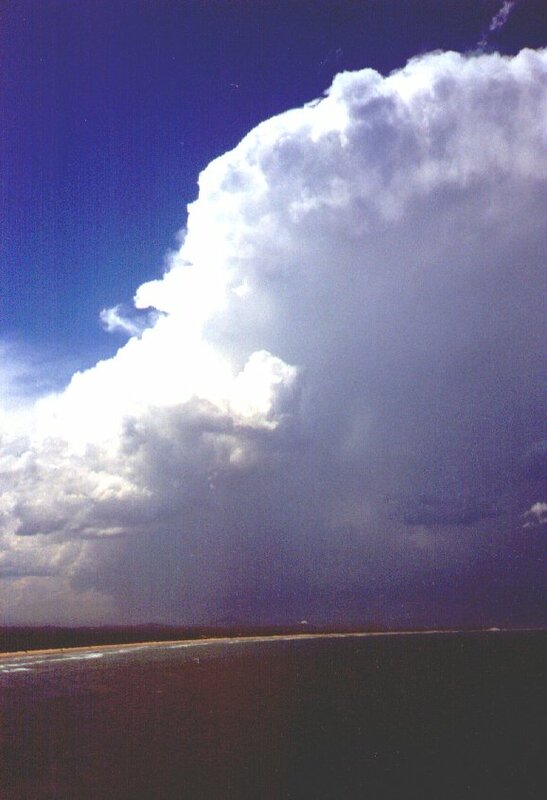 Head and Byron Bay areas bringing large hail and very heavy rainfall. 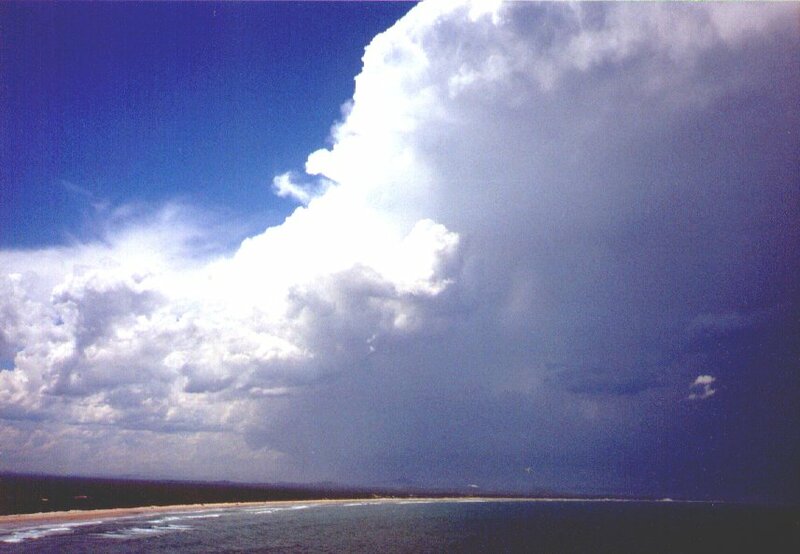 Images of the January 5th 2000 cell which hit Ballina/Lennox Head/Byron Bay at 3pm taken looking NW/N/NE from Evans Head 16 nautical miles to the south. This image obtained from Bureau of Meteorology.